One of the many pleasures of my apartment is the fig tree in the back yard. It is old, as old if not older than this 4-plex I live in which was built in 1938 according to county records. That’s three quarters of a century. It is bent and gnarled and many of its branches lie upon the ground, but every summer since I moved in the branches are laden with the largest figs I have ever seen. Here are some ways I use my bounty – recipes follow post with a secret at the very end –Enjoy. Fresh: Sliced onto my almond butter sandwich for breakfast or lunch, quartered and tossed in salads, minced into a balsamic vinaigrette, added to balsamic reduction relish w/red onions. Frozen whole: Freeze many whole in Ziploc bags. They make great ice cubes for white wine or champagne, which once they thaw are a tasty treat. Added to cookie, cake, bread recipes in addition to honey and molasses or whatever sweetener you use. Stirred into spaghetti sauce. 1-2 cubes add an interesting flavor note, fiber and valuable nutrients without being overpowering or readily identifiable. Added to mole and other sauces in lieu of sugar or chocolate. Added to various salad dressings. Today, as my freezer is maxed out, I’m adding a new recipe to the list. Fig Butter/Jam made in the crockpot. I don’t particularly like to cook my fruits. I think nutrients are lost in the process, but I’m out of room in my freezer and I have many figs to go, so Fig Butter or Jam seemed like the next best way to go. I will store them in the fridge, however instead of the pantry. 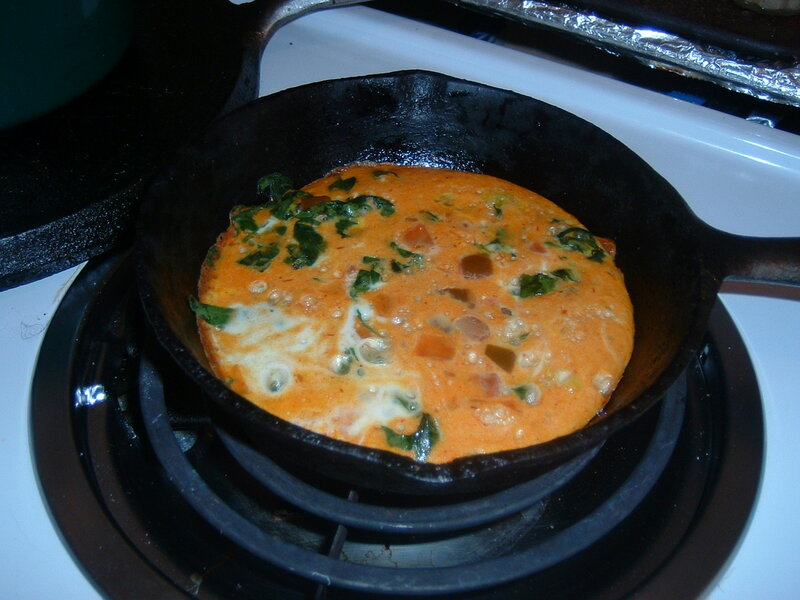 I found several recipes on-line that are almost what I want, and I’ve taken a little from each and made my own. I always say, if you don’t cook, follow the essentials of a recipe exactly. But, as any true home cook knows, if you know the rules, you can break them, change them, tweak them and make any recipe truly your own. I object to over use of sugar in our prepared foods today especially in fruit that is already sweet on its own. That is usually the first thing to go in any recipe of mine. My oatmeal cookies are sweetened with a purée of golden raisins softened in hot frozen concentrate apple juice and a little molasses for flavor and nutrients. You get the point. I love the flavor of maple syrup or organic wild honey which both marry well with figs, so I’m making my first batch with 1/2 cup Maple syrup (Grade B is more nutrient dense and flavorful than Grade A). I’ll probably be picking more figs later in the week, so I’ll do a later batch with raw honey, but I’m out of honey at the moment. 1 t vanilla optional – all the recipes I read called for vanilla; I personally consider it non-essential. Toss all ingredients in bowl to mix ingredients then and put into crockpot. Cook on high for 2 hours, checking from time to time to mash down with potato masher and stir. Turn crockpot to Low; crack lid to let steam escape for duration of cooking – 6 – 7 more hours. Fill hot sterilized jars with hot fig butter, put on reusable canning lids and process in hot water bath for 10 minutes. Let cool. If you have a cool pantry, store there. I prefer to refrigerate or freeze in portions (when I make room in the freezer). This recipe only makes about four 8-oz jars, but as it’s so easy and I work at home, I can do a batch a day without too much effort. 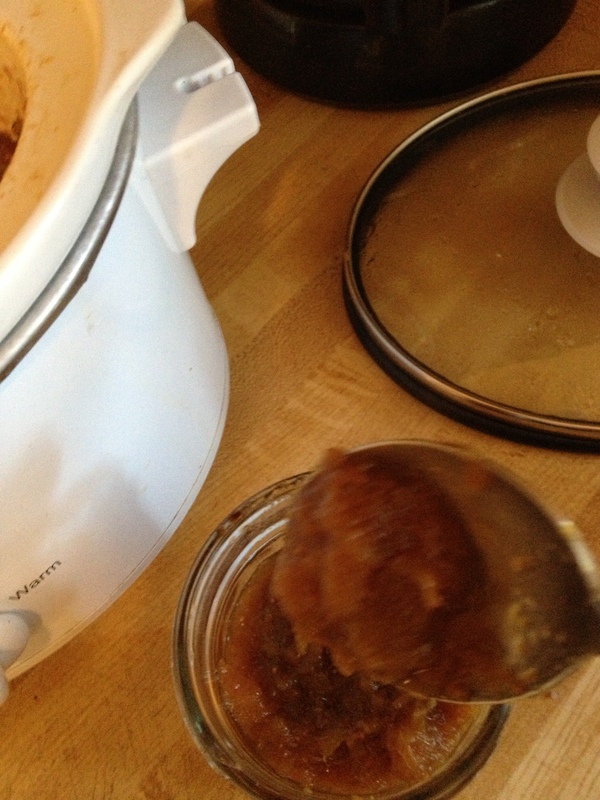 If you have a larger crockpot (wish I did), larger batches work just fine. For those working folks, it’s a good weekend or overnight project. Process all the ingredients together in a food processor until it the mixture is desired consistency. I like chunky; some folks like smooth. Makes approximately 1 1/2 cups of Jam – Store in clean preferably sterilized Mason jar and keep refrigerated. Lasts up to 2 weeks as long as only clean utensils are used to scoop out. Freeze in ice cube trays, store cubes in Ziploc bags for future use. Here’s my secret. The freezing and blending are a piece of cake, but truthfully, after the 2nd or 3rd crockpot batch (mine is small and holds only 5 cups of cut figs), running low on honey or maple syrup, I simply tossed cut up figs in ½ cup frozen concentrated apple juice and 1 tsp cinnamon and then cooked as above. They are just as sweet and just as good. Do you love leftovers? I do. My brother, Rick’s, cheesy scalloped potato ham bake was one rich dish among all the other rich dishes, so I only had a few mouthfuls. Easy to do because I know he and mom will insist I take some home for later. We set an abundant table and there is always plenty to go home with each of us. I love potatoes and took several generous scoops in a mason jar to add to my other leftover containers. This morning I put a generous portion in my smallest well-oiled iron skillet, cutting the potatoes into smaller portions, I added diced bell peppers, spinach and let it all begin to brown on the stovetop. Then I beat an egg with a dash of Worcestershire and some Sriracha (red pepper sauce), poured it over the potatoes, and put it into a 350 oven to finish (about 15 minutes). Yum. Sometimes, as above, I want leftovers to be different than the original, but not when it comes to turkey and dressing. The Friday after thanksgiving I love to duplicate the original. 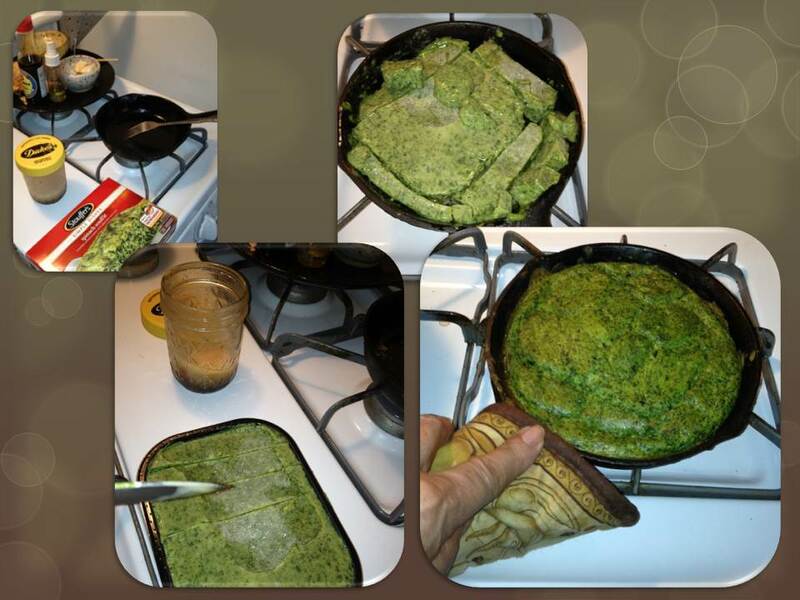 I pull out a slightly larger iron skillet, butter it and carefully arrange the turkey and dressing with liberal dollops of gravy over them, followed by a portion the 3-cheese broccoli mushroom bake and some sweet potatoes prepared with onions and other spices – no sugar thank you. I’ll put this to reheat in the oven around 6 to be ready by 7 and enjoy a Thanksgiving dinner encore. Replete, I’ll pour another glass of wine and settle down on the couch to read, write in my journal, listen to music or throw on an old movie – programming is barren on the wasteland tonight.